I've wanted a jewelry cleaner for a while. I have a fair amount of jewelry. Some of its real, some of its fake and a lot of it is tarnishing itself. I'm also lazy. 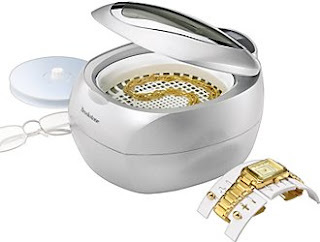 Staples is selling the Brookstone Jewelry Cleaner for $50 this holiday season. My local store has it clearanced for $29, which should have been a tip off but reviews on the website seemed fair. This ring is my dirtiest piece of jewelry. I bought it when I was 15, haven't worn it for about a decade but keep it in a box in the computer room. Yep, it doesn't get anywhere near my other jewelry and I should probably get rid of it but I'm sentimental and cluttery. This bracelet was getting that foggy yellowish tinge silver likes to get before it tarnishes for real. I found a few more other silver pieces that were a tad yellow and set the cleaner at medium speed (for jewelry) and the longest amount of time (8 minutes). I added a few drops of dishwashing detergent, as suggested by the reviewers. It looked very ultrasonic and futuristic. It wasn't loud at all. I placed it in the kitchen while I ate and listened to the radio from the other room without any issue. Wash #1 was a large bust. The jewelry looked exactly the same. This picture has a flash so any difference you see if from brighter lights. For wash #2 I set it on Heavy Wash, for the longest amount of time and added more soap. Since this was a trial run I removed the items of greater value. The water was cloudy afterwards but I think that was just the added soap. Even on heavy duty with extra soap my jewelry looked exactly the same. 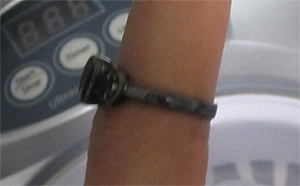 I'm not talking about this obviously heavily tarnished ring. All of my jewelry looked exactly the same. I don't recommend this product. Don't buy it even if you find it on clearance, with a coupon and can pay using last month's ink rewards. Its just going to create clutter without removing any grime. Obviously it wasn't a decluttery day since I bought this thing home. I did eBay a wallet I bought hoping to have it replace the wallet I tossed last week. It turned out to be too bulky for me but hopefully its going to a new home where it will be appreciated! I, too, am lazy, so if you find a decent one, let me know!